Remote workers may be more productive and more satisfied with their jobs. Do you have a telecommuting policy in place? If not, you could be losing out on a golden opportunity to improve staff morale and increase employee satisfaction. The reality is the modern business is a very different place than it was 20, 10 and even five years ago. Organizations that fail to keep up with telecommuting trends may fall behind competitors when attracting top talent. Of course, you can't reshape your workforce overnight, especially when it comes to laying down the proper IT foundation to support telecommuting employees. Working with an IT service provider can help businesses get into a position to support expanded telecommuting policies. It's not unusual for department heads to view telecommuting with a degree of skepticism – and for good reason. After all, businesses have been built around an office culture for decades. Taking the employee out of the office is a pretty radical notion. "Providing staff with work-from-home options presents a considerable advantage." There are potential challenges from a logistical standpoint as well: Managers may have less direct oversight with their team members and it may be more difficult to get ahold of remote workers. With that in mind, why should you consider embracing work-from-home policies and even full-time telecommuting options? Studies have shown that remote workers typically report higher levels of job satisfaction and engagement. According to a PricewaterhouseCoopers study, employees who work from home at least one day a week were 48 percent more likely to rate their job satisfaction as a "10" on a 10-point scale than those who go into the office every single day. The report also found correlations between employee contentment and work-from-home policies at companies like Cisco and Microsoft. Staff members with telecommuting options have more time to spend with their families, run errands and pursue activities that give them a sense of fulfillment outside of their professional life. Since these employees don't need to deal with the rigors of a daily commute, they may experience less stress and enjoy more free time. Providing staff with work-from-home options presents a considerable advantage when attempting to land coveted professionals with in-demand skill sets. It's a major selling point for any business looking to bring in the best talent available. One of the more common reasons managers and department leaders are hesitant to put some kind of remote work policy in place is they worry about employee productivity. They may think that because telecommuters are largely unsupervised and can be somewhat autonomous, that their work will suffer. This mindset neglects to consider the amount of time in-office staff waste every day when they're just punching the clock. A suitably motivated remote worker may actually be more productive than their office counterparts. The PwC report cited the example of Chinese travel website Ctrip, which extended telecommuting options to call center staff. Those individuals completed 13.5 percent more calls than in-office employees. Giving staff members more autonomy empowers them to tackle their professional responsibilities in ways that best fit their personal methodology. Some employees will be more productive first thing in the morning, while others may need a couple of hours to get going. And then there those who burn the midnight oil because that's when the creative juices are flowing. As long as the work is getting done – and getting done right – a work-from-home policy can be incredibly successful. To really capitalize on telecommuting, businesses need to provide all of the tools and resources necessary for employees to do their jobs effectively outside of the office. Whether they work from home, in a coffee shop or some other remote location, they need to be able to tap into the same software and platforms that office employees use. That means embracing the cloud and shifting key business tools to hosted platforms so all staff members can access them anywhere, anytime. You'll also need to consider your communication options. Remote workers should never feel like they're all alone on an island. To keep them looped in on project updates and day-to-day goals, you may need to implement a unified communications platform. Assets like VoIP, instant messaging and video conferencing tools can ensure telecommuters are able to get in touch with their managers whenever needed. Cloud-based collaboration software can also help improve collaboration between diverse workforces. Regardless of whether team members are located in the office, on the road or in the living room, they can provide updates on ongoing projects and share important documents so everyone stays on the same page. Of course, none of these tools will do much good if your organization struggles with downtime. Working with a reliable IT service provider with a demonstrated record success will help ensure your remote employees have access to critical data, documents and software whenever they need them. Ideally, you should look for a cloud service provider with redundant hosting infrastructure, so you know that even if an outage in one location occurs, they will be ready to failover to another data center site. 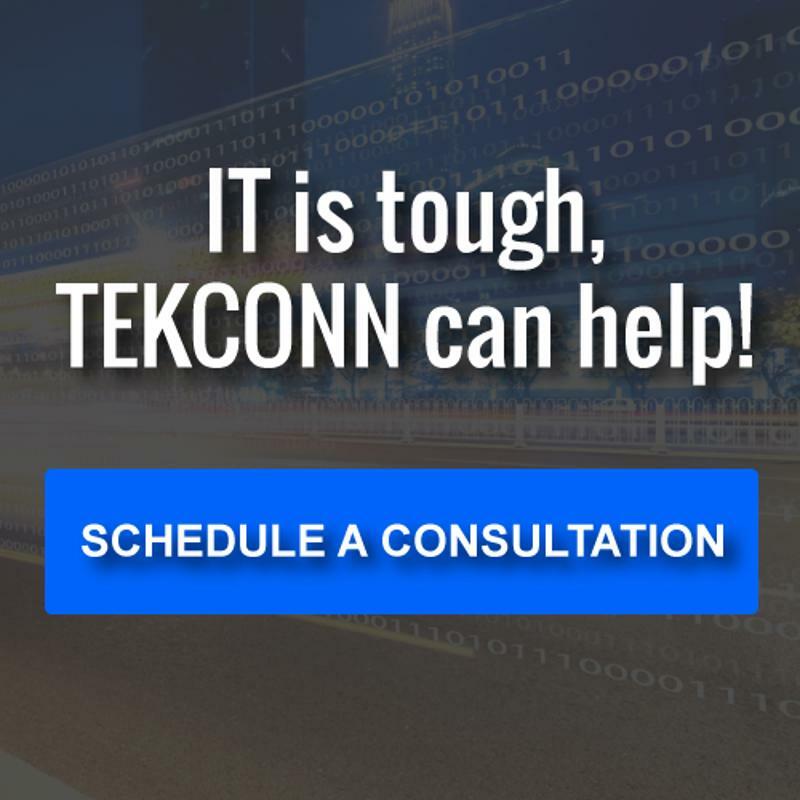 If you want to get the best IT services NYC has to offer, look no further than TEKConn. We can help you achieve whatever goals you have for 2018, including creating a remote workforce.